are briefly explained in this page. Dynamic images (animations) of the simulation results are shown in the page of [CG Gallery]. In a narrow sense, the phrase "particle method" means a gridless solver of the Navier-Stokes equation. As for this kind of particle method, the SPH method and the MPS method are used broadly. By Eulerian methods using fixed calculation points in a computational grid, it is not easy to track a complicated behavior of water surface with a fragmentation and a coalescence of water. In a particle method, particles play the role of Lagrange calculation points interacting with each other, hence each term of the Navier-Stokes equation is discretized as an interaction between particles. Therefore, complicated behavior of water surface can be tracked by a simple algorithm. To estimate information, such as a wave force, wave overtopping discharge, and so on, effectively in a coastal structure design, a numerical wave flume on the basis of particle method is developed, as a simulation tool of three dimensional wave field. The development of accurate particle methods (CMPS-HS method, CISPH-HS method, etc.) for improving the incompleteness of the momentum preservation and problem of pressure fluctuation in the previous particle methods, parallel computing to track over 1,000,000 particles, and boundary connecting technology with a particle method and a depth-averaged model represented by the Boussinesq model are introduced. Although a violent flow with whitecaps and splash, such as wave breaking at a coast or a hydraulic jump in a river, was difficult to be simulated by the conventional numerical models of fluid, a simulation of violent flow is enabled by a particle method, which can track complicated behavior of water as the Lagrangian solver of the equation of motion of fluid. Following figure shows the snapshot of breaking wave simulated by 3D particle method (CMPS method). Activities of our laboratory are not limited to applications of existing particle methods to various hydraulic phenomena. In our laboratory, a basic study of the calculation principle, which can be applied to all related fields of fluid science and engineering, is performed. SPS-Turbulence Model for turbulence calculations of the particle methods is the technique that is developed firstly by our laboratory. Accurate particle methods (CISPH-HS method, CMPS-HS method, etc), which have been developed in our laboratory, have been published on international academic journals registered with ISI Web of Science of THOMSON-REUTERS. Our accurate particle methods have been referred not only in construction engineering but also in many research fields of fluid science and engineering. Publications on this subject won a higher rank (Top five) for the plural periods in the download ranking of the Science Direct “Top 25 Hottest Articles (Coastal Engineering)”. Corrected Incompressible SPH method for accurate water-surface tracking in breaking waves(Volume 55, Issue 3, March 2008)：4th rank in Jan-Mar 2008 and Apr-Jun 2008 periods. Modified Moving Particle Semi-implicit methods for the prediction of 2D wave impact pressure (Volume 56, Issue 4, April 2009)：2nd rank in Oct-Dec 2008 period; 3rd rank in Apr-Jun 2009 period. Enhanced predictions of wave impact pressure by improved Incompressible SPH methods (Applied Ocean Research, Volume 31, Issue 2, April 2009):1st rank in Oct-Dec 2009 period; 2nd rank in Jan-Mar 2010 period. In Annual ranking Top 25 Hottest Articles (Applied Ocean Research) in the academic year Oct. 2009- Sep. 2010, our publication is ranked first. In addition, Top 25 Hottest Articles (Coastal Engineering) in the academic year Oct. 2009- Sep. 2010, ranks our publications at 4th and 6th. Our publication: Corrected Incompressible SPH method for accurate water-surface tracking in breaking waves (Coastal Engineering, Volume 55, Issue 3, March 2008) has been listed in the top 10 cited papers (articles published in the last five years, form 2006 to 1010) of Coastal Engineering (as of January 4, 2011). In this list, our paper is the only 2008 paper (Other papers in the list were published in 2006 or 2007). 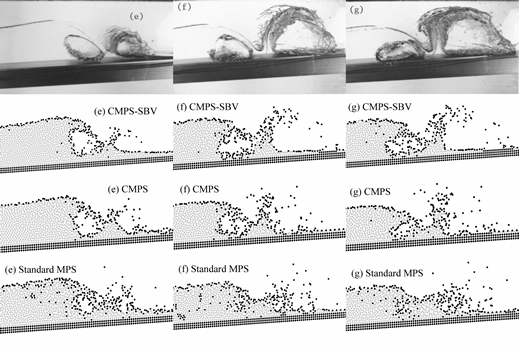 Following figure shows the comparison of accurate particle methods (CMPS method and CMPS-SBV method) developed in our laboratory with the physical experiment of plunging breaker by Li and Raichlen (2003). The results of standard MPS method are also shown in this figure. Although the standard MPS method has problems in reproducing the shape of the air chamber and the secondary jet, our accurate particle methods show remarkable improvement of the agreement with the physical experiment. The target of the particle method is not limited to a fluid. The particle method is a general model of a continuum, which can integrally describe an elastic body, a plastic body and a fluid. Large deformation phenomena that caused difficulties in application of conventional technique, such as the FEM, can be analyzed by a particle method. The multi-physics that unify various phenomena in three major dynamics related to construction engineering, such as structural mechanics, soil mechanics and hydrodynamics, is possible. In our laboratory, the hybrid model of elasto-plastic body and fluid based on the particle method has been developed as a tool of interface fields between soil mechanics and hydrodynamics. This model can be applied to the prediction of a river-bank destruction due to flood for urban disaster prevention. 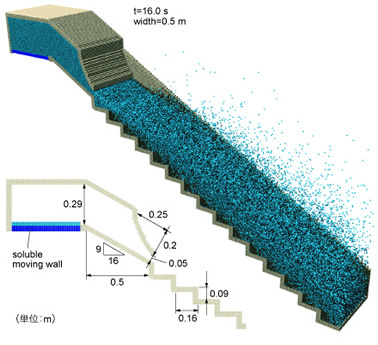 Following figure shows the simulation result of a collapse of an overhanging cohesive soil cliff. The collapse process, which is caused by the sudden change of the stress state in the ground by the outbreak of the crack, can be tracked. Large deformation problems, that were unable to be simulated by conventional methods like the FEM, can be dealt with by the particle method. For the full-scale three-dimensional calculation of the particle method, a large-scale calculation tracking over-million particles is indispensable. 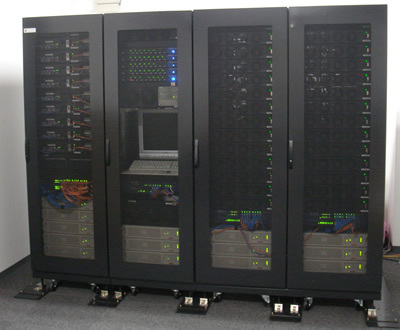 The 48-nodes PC cluster (parallel computer) in our laboratory supports the development of the parallel calculation technology for particle methods. Because bottom boundaries of natural streams in rivers and coasts are mostly constituted by sediment, sediment hydraulics for the flow over a movable bed plays a primal role in river and coastal engineering. In our laboratory, the basic researches in the computational mechanics of sediment transport are conducted. Numerical simulator of the flow over a movable bed is being developed on the basis of mechanics of multiphase flows and granular materials, to describe the interaction between the flow and the sediment particle and the inter-sediment collision. This tool is called "Numerical Movable Bed." Computational mechanics of sediment transport analyzes river and coastal sediment based on the hydrodynamics of the multiphase flow and the mechanics of granular material. The study of this field progressed rapidly from around 1990 when a numerical tracking of sediment particles became to be possible by using high-performance computer in the data-processing center of university. A study on computational mechanics of sediment transport has been conducted in our laboratory since the dawn of this research field. 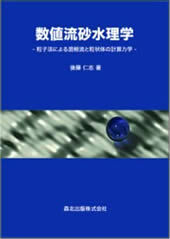 The theory of this research field is summarized in the following book. 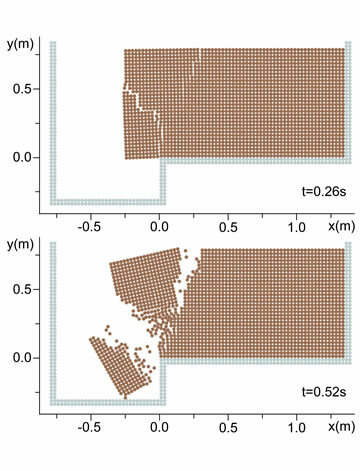 A tool to practice computational mechanics of sediment transport is the "numerical movable bed". In our laboratory, the MBS(Movable Bed Simulator) had been developed, and computational mechanics of river and coastal sediment transport has been conducted. In addition to joint researches with researchers of hydrodynamics, collaborative research with researchers of science, such as geology and sedimentology, have been carried out. Furthermore, in late years, it has been expanded to a model, which can deal with the complex behavior of armor blocks installed in the front of a seawall, for the practical use. A new study area "Computational Coastal Morphology" handling dynamics of the triangle interaction of wave, current and sediment is expected to be established in future by combining the MBS with the above-mentioned numerical wave flume. 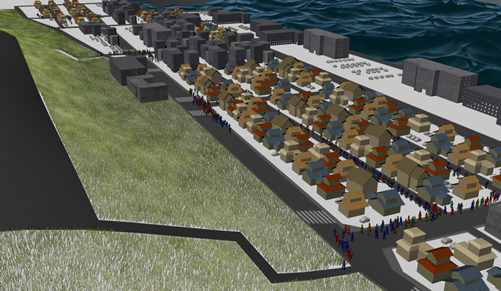 Simulation of crowd evacuation is a convincing tool of an evacuation planning in disasters. Because an individual-base particle system model treats a personal behavior directly, it is most suitable for a reproduction of details of an evacuation process. If a person is regarded as a single particle, a crowd is a granular body with gathering particles. Auto traffic and the pedestrian crowd in urban areas can be interpreted based on the physics of a granular body. But because a person acts actively based on self-acquired information, the mathematical model of an active behavior is necessary. In our laboratory, the crowd behavior simulator CBS has been developed. CBS has been applied to disaster evacuations (CBS-DE), such as evacuations at the time of floods and tsunamis, evacuations at the time of the fire from the underground spaces (shopping center, a tunnel, etc.). CBS can be also applied to a pedestrian space design, such as a railway station square. Quick evacuation is indispensable for survival of local inhabitants hit by a tsunami directly. Hence, preparing safe evacuation route is quite important. However, reproduction of imminent situation in a real disaster is impossible in an ordinary evacuation training and there is no means how to choose the appropriate evacuation route. 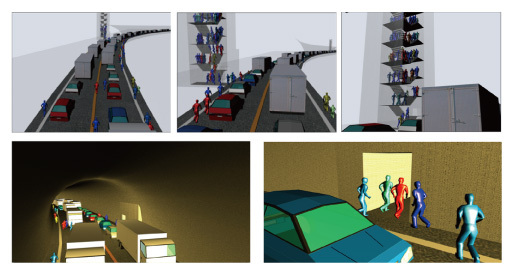 To overcome this difficulty, a crowd-evacuation simulation must be constructed to reproduce the process of the crowd-evacuation action in a human-scale. The CBS also can simulate behavior of people in an ordinary situation such as behavior of pedestrians in a railway station square. Optimum width of a pavement can be estimated by the CBS. Although, for resolving complicated urban problems, a science-and-literature integrated approach is necessary, various urban phenomena can be understood through human interactions. Social psychological factors are still difficult to be analyzed qualitatively, but as means of the scientific prediction trusted by majority of urban residents, immediate development of quantitative model of urban resident behavior is truly required. In this model, the description of the micro process of the phenomenon is the key. The Lagrangian crowd behavior model, which calculates the interactions of the individuals directly, possesses high possibility in describing the essence of the human behavior as an interaction system. Developing computational hardware will make an over-100,000 people scale calculation possible in the near future. A construction of a Virtual City as the tool of the social experiment in a virtual space will be realized.